The driver will meet us at your hotel in Ouirgane or Marigha at 9 am and we will head forward to Ijoukak, passing by the Ouirgane lake and several berber villages. 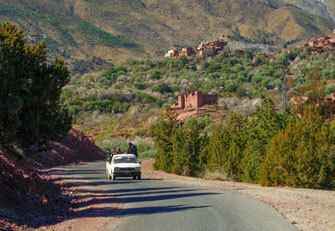 In Ijoukak, where the Agoundis Valley joins the Nfis, there is also an important local berber market every Wednesday. After a short stop, we continue our drive to Talaat n'Yakoub, from where we start our about 1h30 walk to the Tin Mal Mosque, passing by the villages of Ait Berihi and Imawnan. 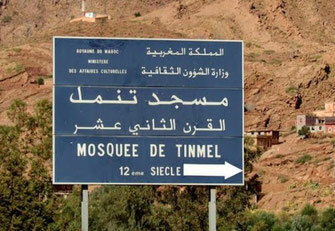 The Tin Mal Mosque was built in 1156 to commemorate the founder of the Almohad dynasty, Mohamed Ibn Tumart, and is besides the Hassan II Mosque in Casablanca the second mosque in Morocco which can be visited by non-Muslims. 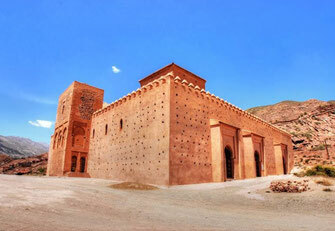 It also was the model for the Koutoubia in Marrakesh and is listed on the UNESCO World Heritage Tentative List since 1 July 1995 in the Cultural category. After this visit, the driver will pick us up at the mosque, and on the way to the Tizi n' Test at an altitude of 2092 m, we will enjoy lunch in a berber family and visit a pottery village. The pass of the Tizi n'Test was the first modern route to link Marrakesh with the Souss plain and was built by the French from 1926 to 1932. We will return on this spectacular road to Ouirgane / Marigha and will be back in the late afternoon. Prices depend on number of persons. Are you in the Ouirgane / Marigha area or do you need transfer from Marrakesh? Please do not hesitate to contact us - we will submit our best offer as quickly as possible. Don't forget sunglasses, sunprotection etc. and wear comfortable clothes.